The Bookshop (founded in 1971) is in the Administration area of the University of Papua New Guinea's Waigani Campus in Port Moresby, close to the Post Office, and ATM (Automated Teller Machine). Use the Top Car Park if driving. A vision and a task is the joy of the world"
Despite being the foundation of Univentures when that was set up mid-way through 2007 UPNG Press and Bookshop Management has never had the opportunity to report - whatever reports that have eventuated have been tacked on at UPNG Management level. As such the main event of 2012 must be realising that mature businesses that had been with the university since the beginning could not be put at risk by too close a linking to much more risky ventures. Thus UPNG Press and Bookshop has now been registered as a company in its own right. This was effected at the end of 2012. There have been significant - if not fatal - problems with university business in Papua New Guinea. Hopefully the present company has sufficient experience to avoid further problems and make progress. Many of the past difficulties will remain with Univentures and developments there will need to viewed with concern. As there are various other documents that will be provided to the Board these need not be duplicated here. These are the headlines!! This is I think the sixth structural change for the Bookshop over some 40 years - all of them a result of some negative movements finally identified by the university. If there had been sustained growth. 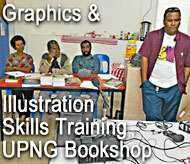 however limited, throughout - the UPNG Press and Bookshop would be the major player in the region. We hope future changes will come about as swift reactions to real opportunities rather than collegial sleepwalking. Bookshop - Income this year will exceed 4 million - up from 700,000 in end of 2005. A strong niche area has been developed in the Last Unknown Book Nook an area specialising in New Guinea and Pacific books. This marks the only expansion in space available since the Bookshop began operating in this area. 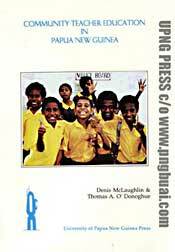 UPNG Press - We now have a list of well over 300 titles - there were none available in 2005. A strong list of titles is under development. Many of the titles are print on demand and this do not involve storage issues. Agency titles - There are in excess of 3000 of these as a result of a agreement with Sterling Publishers India. This wider range has enabled us to bid successfully for the READ PNG project. Staffing - A graduate - Greg Bablis - was appointed in March with a view to strengthening the editorial side as well as the niche area. He has subsequently received training at the Institute of Book Publishing in India. A link with the student group the Voice is also being developed with a view to engaging some of their people and two were employed over 2012. A new structure will be in place in 2013 and all positions will be advertised. UPNG Press progress has not involved any additional staff and has been done within the ongoing activities. For this to happen a partnership approach has been essential. These involve Masalai Press in the US and Sterling Publishers in India. To keep these on track it was valuable to arrange a visit of Tom Slone from Masalai in 2012 - a report is available. The Sterling JV will be discussed during a visit in 2103. As to the web - N. Chan in Canada has for many years assisted us at no cost (to date!) - in arranging the hosting of electronic documents and catalogues on the pngbuai website. We have been quite pioneers as a result. Various JV agreements have been entered into in PNG with a view to developing the publishing framework through allowing for better terms to authors and also in keeping them with UPNG Press. This has been successful and these agreements will be reviewed by the new company in 2013. We will follow through on partnership opportunities with the PNG Department of Education - initiated in 2012. We need to make more use of the agreement signed with Open Campus management and to finalise agreements with the UPNG Library. We are making progress with the Australia Coop Bookshops with a view to their supplying us at special rates. Given their expertise and reputation this will be valuable. This has brought in over a million kina - unfortunately most of this has been disbursed back out again to students - a major drain on staff time without being productive of profit. Relationship with OHE and the officials concerned over the time have been very good. OHE had trusted us with funds from the first stages. There is no doubt we were slow to respond effectively to the minimart idea - lack of space being critical. There has not been helped by confusion internally and also a different visions institutionally. The main issue is to improve retail offerings here - which have gone down well - and to sell documents that could be used elsewhere (Internet cards, IPI and Brian Bell) for basics that dont really fit in with plans / space. This will occur in 2013. We do have experience from other institutions to draw from and the observations of the OHE staff on that. 2013 funds will be by sales to students only and no re-imbursements. 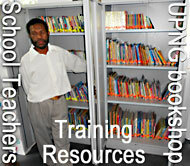 We did obtain a portion of the funding available for books to schools under the READ PNG project. This progressed at a snails pace during 2012, and the contract was only just prepared at years end. However it is the first time that we have gained a place amongst major players - despite what may be seen as a dubious ethical environment. Value is some 1.5 million. Having acquitted the 2011 payment - we continue with the second tranche of the LNG project - this has been subject to the delays associated with LNG areas and specifically with the exceptional flooding at Kikori at the end of the year. Continual changes at LNG have not helped - but interest in the project is now much increased and we should have a good end over 2103. We have to overcome project design faults. We continued the tradition of a rather sporadic attendance at the Asia Pacific Publishers Association. This has always been with the intention of putting PNG on the regional map - not an easy task with some of the members. However, progress has been made and a full report of the latest attendance is attached. In future attendance should fall to the Association which we have been instrumental in setting up. Book fairs - Owing to limited time only one book fair was attended at Frankfurt - this allowed for planning in association with the bid mentioned above under Sterling - UPNG Joint Venture. This was combined with leave arrangement to save money. We have supported the development work and the registration with IPA of the PNG Publishers Association. This will hold its first meeting soon and will make very necessary representations to Government as to the development of this essential element in national development. Links with publishers have been forged via Book2Buk meetings held at UPNG. 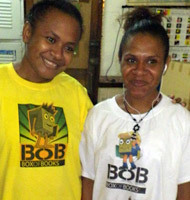 The Association should be a main driver for the organisation of a PNG book fair and issue related meetings. With financial support of AusAID we have distributed further copies of the Mike Bourkes Food and Agriculture book throughout PNG. In addition we have distributed copies of various ANU publications and books from of ANU staff members to institutions including our own library. Dr Cookson (Go8 project) has been very active in arranging this and this work will continue. It is good for our reputation and for library development. Carols by Candleight - K500 to support Christmas concert in the Housing area. We should support some more sports and social activities but clear guidelines are needed as to things to be supported and the maximum cost. Library Training and Community Publishing Workshop 2012 held in what is now the Book Nook PNG-Pacific Collection. Participating teachers were from the four PNG LNG Project areas in Central (Porebada, Lealea, Boera, Papa) PNG.